Roxana enlightens the group with facts about various Japanese vegetables. 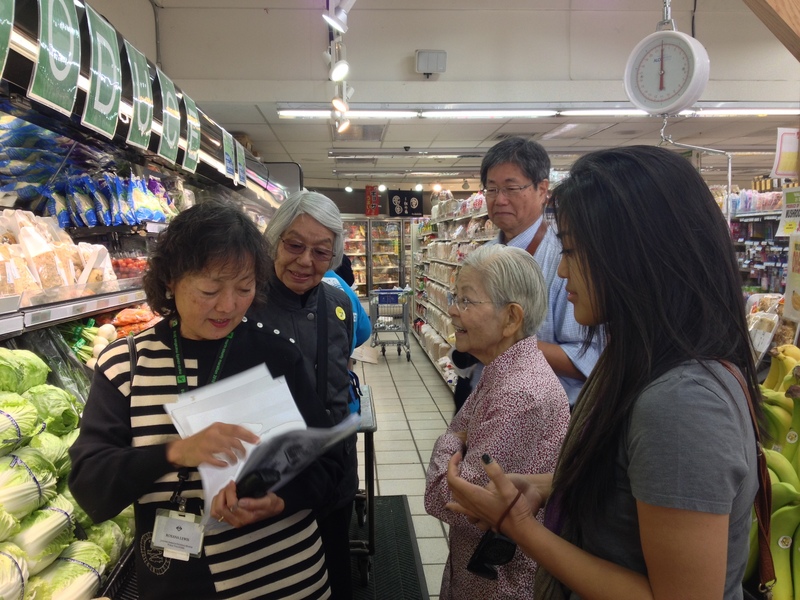 On November 16th, JANM volunteer Roxana led a very special vegetarian edition of Edible Adventures in Little Tokyo. 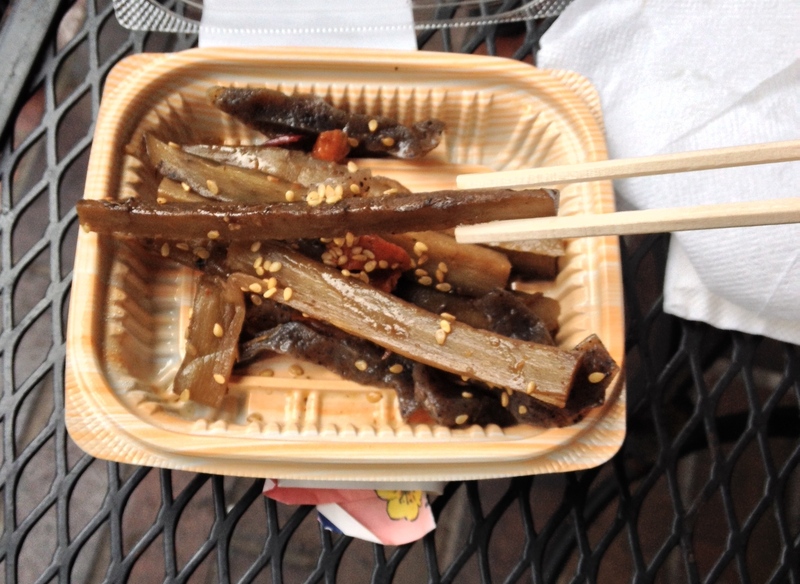 From 10am to 2pm, a group of foodies followed Roxana through Little Tokyo. 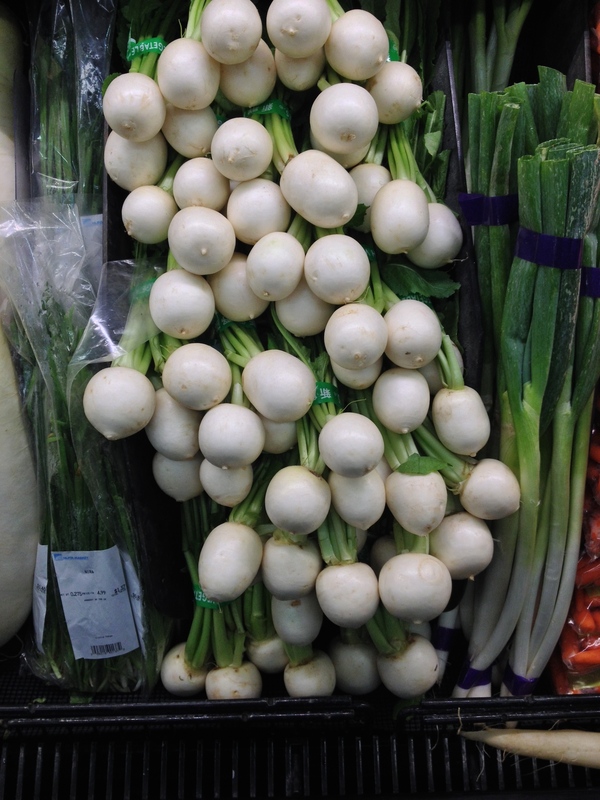 Roxana enlightened the group about Japanese vegetables while giving the group a chance to sample them along the way. The group sampled a cooked and seasoned batch of gobo from Nijiya. This Edible Adventure was more than just learning about vegetables—the group also got to tour all three exhibitions at JANM, learn interesting facts about Japanese American history and Little Tokyo, and discover new foods and restaurants! Check out these photos from last Saturday! The group also visits the Go For Broke Monument before starting their Edible Adventure. The group learns more about popular Japanese mushrooms, such as shiitake, maitake, and bunashimeji. Shishito is a small sweet pepper. 1 out of 10 of them are spicy, but there is no way to tell which one is spicy without biting into them! Roxana holds up a raw stick of gobo as she explains the preparation involved in cooking gobo. The group huddles around Shojin’s menu, excitedly deciding what to order! Shojin is located in Little Tokyo and is dedicated to serving chemical-free, vegan, organic, and naturally delicious foods! Shojin uses Origami Balloon lights to create an intimate setting. The group got to try fried shiso leaves stuffed with tofu as one of their appetizers. The group tries fried cauliflower as one of their appetizers at Shojin. One of the group members orders a vegan hot and spicy ramen at Shojin. One member orders the fried avocado salad from Shojin.